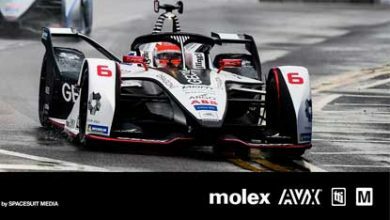 The Maxim Integrated’s new MAXM22511 dramatically simplifies and shrinks the design of field bus communications systems for factory automation, motor control and other industrial internet of things (IIoT) applications. 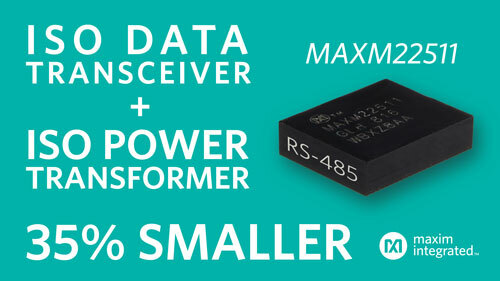 Bringing intelligence to the edge of typically noisy industrial environments calls for the high efficiency and robustness delivered by the new MAXM22511 2.5kV isolated RS-485/RS-422 module transceiver with power from Maxim Integrated Products. Full industrial convergence calls for intelligence at the edge of the automated factory to enable self-diagnostic and autonomous capabilities. In order to actively monitor and communicate real-time health and status information required by these environments, factory subsystems demand field bus communications systems that meet stringent size and power efficiency requirements while supporting operations in noisy industrial environments. The MAXM22511, the first in a family of isolated communications ICs, addresses these challenges while simplifying field bus communications system designs. 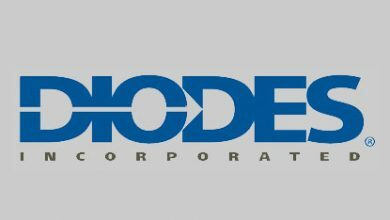 The highly integrated module accomplishes this by eliminating the need for discrete digital isolators, transceivers, transformers, and transformer drivers while also reducing bill of materials (BOM) costs. The MAXM22511 supports 25Mbps data rates while providing 60 percent DC-DC efficiency (2x better than competitors) and +/-35kV electrostatic discharge protection (2x better than competitors). The module is available in a land grid array (LGA) package (9.35mm x 11.5mm, which is 35% smaller than competitive solutions). High Integration: the module integrates isolated data and isolated power in a small package. By eliminating the need for four discrete components, it reduces BOM costs and simplifies the design. Power Efficiency: the module’s 60% DC-DC efficiency is double that of competing solutions. 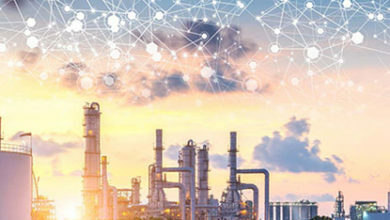 Robust Operation: 2.5kVRMS isolation supports reliable communication across the isolation barrier to ensure safe operation of industrial equipment. The module reduces electromagnetic interference (EMI) and its +/-35kV electrostatic discharge protection (human body model, or HBM) is twice the level of the closest competitive solution.